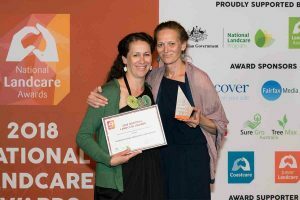 Congratulations to Wandoon Estate Aboriginal Corporation who last night won a National Landcare Award in the Australian Government Partnerships for Landcare category for their work on Coranderrk. Set up as an Aboriginal Reserve in 1863, Coranderrk closed in 1924, but in 1999, the Indigenous Land Corporation purchased 80 hectares of the property, handing it to the Wandoon Estate. Today, Coranderrk is both a working farm and valuable habitat for threatened species, including the Helmeted Honeyeater and Lowland Leadbeater’s Possum. The PPWCMA is proud to be one of many organisations partnering with Wandoon Estate to restore environmental health and productivity to the farm, doing so through our Yarra4Life Program, Regional Agriculture Facilitator (Karen) and Regional Indigenous Facilitator. The PPWCMA nominated Wandoon Estate Aboriginal Corporation and Coranderrk for their original Victorian Landcare Award, which made the eligible for the national award. Read about their Victorian award.